The exhibition including scenography, all exhibits and all media are shipped in one 40-foot container to the venue. The exhibition can easily be adapted to local circumstances. Furthermore the Museum für Gestaltung Zürich provides templates for all texts and information graphics which are shown in the exhibition as printable files. 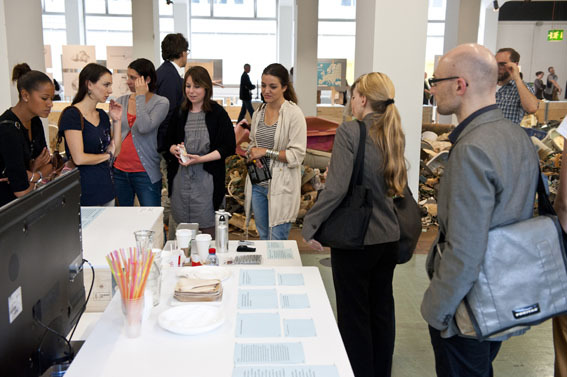 In addition to that, the Museum für Gestaltung Zürich provides consultation on the set-up and planning of the exhibition according to the specifics of the venue, and assists in developing an educational program if necessary. 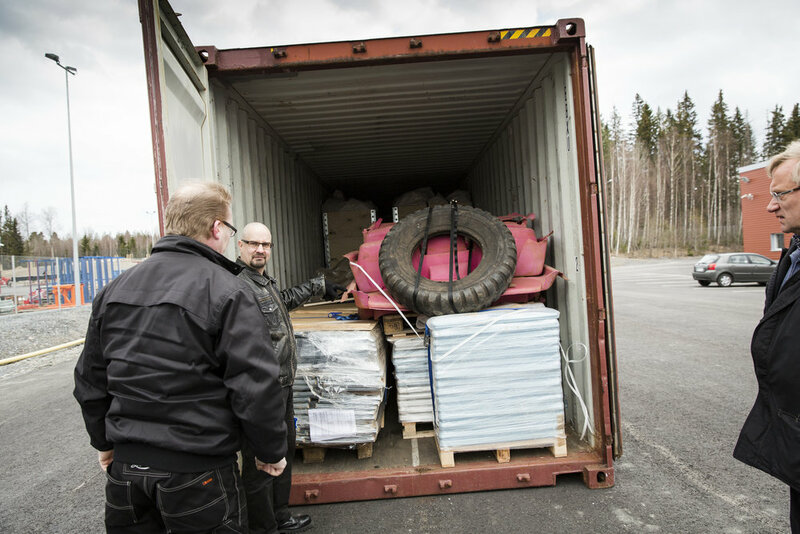 The exhibitor provides a suitable exhibition space, is responsible for the unloading and the packing of the container and has to build up and dismantle the exhibition. The shipping container has to be stored by the exhibitor or displayed on site. The exhibitor may replace some of the exhibits with local products and secures the operation of the exhibition, is responsible for the safety and insurance on site and meets the conservational requirements. The exhibitor must provide the technical infrastructure (light, projectors, screens etc.) and translate all texts and information graphics displayed in the exhibition. The exhibitor is responsible for communication and marketing and is committed to offer a comprehensive education program, which consists of multiple formats (e.g. guided tours, workshops, clean-up days, discussion groups, etc.) for different target groups. The exhibitor is - in addition to the education program - dedicated to form cooperation with local initiatives dealing with the subject of Marine Debris in order to create a sustainable impact on the community and allow visitors to engage themselves with the topic beyond the exhibition`s run-time. Traveling Exhibition "Out to Sea? The Plastic Garbage Project"
While travelling on his sailing boat Alguita in 1997 Captain Charles Moore encountered a horrifying phenomenon whose suspected existence had been the subject of vague conjectures by many scientists. Moore, a chemistry graduate, was taking a short cut through the horse latitudes between Hawaii and Los Angeles when, in the middle of the ocean, he came across an enormous collection of floating plastic garbage. As it turned out later, the bottles, lids, bags and detergent canisters were merely the tip of the iceberg. We all believe that we live in a globalized world. Thanks to satellites and internet, information and current events spread around the entire globe within seconds. But things are very different as regards one of the biggest current ecological problems: the littering of our seas with plastic. Silently and unnoticed, huge vortexes of garbage have formed over a period of decades. It was only in 1997 that the first of them was described by Captain Charles Moore. In summer 2009 an impressive article «Eine Ahnung von Apokalypse» («An Intimation of the Apocalypse») appeared in the monthly supplement NZZ Folio. After reading it I could not sleep. I decided to devote a major exhibition to this catastrophe. About the end of design and what we will leave our children. An exhibition on the archaeology of the future. In 2010, when the first two crates filled with plastic flotsam for the planned plastic garbage exhibition arrived in Zurich (collected by Beach Environmental Awareness Campaign Hawai’i), we initially feared that our test exhibits might have been attacked by mold. But there was no need to worry: the salt water had proved to be an excellent means of preservation. Picturing how our everyday garbage swirls around the seas for years to be finally washed up on a remote beach in Hawaii is horrifying and, at the same time, fascinating. Students from the specialization course in Scientific Visualization studied these bizarre witnesses of our civilization as if they were archaeological finds. The traces of decay left by wind, water and sunlight become legible signs of the worldwide journey made by a design object at the postponed end of its life cycle. September 2011: We want your garbage! The question soon arose about the best way for us in Switzerland to collect the amount of plastic flotsam required for the planned installation. The answer was cooperation with the project AWARE. This international scuba diver organization campaigns worldwide for the protection of sharks and against the pollution of the seas. On the scuba diver platform MyOcean what are known as «Dives Against Debris» are regularly set up. When their major action month came around in September 2011 we asked the divers to send us the pieces of plastic they collected. The Kaho’olawe Island Reserve Commission on Hawaii decided to send us the results of a collection carried out by 30 volunteers over a period of four days. On account of its position amidst the North Pacific currents Hawaii is particularly exposed to plastic flotsam. As Kaho’olawe is an uninhabited island, the amount of plastic debris collected – 4.6 tons! – demonstrates the problem all the more clearly. But it is not just beaches in Hawaii that are gradually being plasticized. The accumulation of debris in the seas and on beaches is a global problem. Today there are numerous committed persons and associations who, under different names, regularly clean up beaches or gather debris from the sea. A number of them sent us the plastic they had collected: NABU from the Baltic, a Balinese surf club from the Indian Ocean, and the nature conservation community Sylt with the Surf Club Sylt from the North Sea. In everyday life, too, a considerable amount of largely unnecessary plastic can accumulate. Even someone who dutifully brings all their PET and HDPE bottles to be recycled and takes a cotton shopping bag with them rather than buying a plastic one cannot avoid it. Figures provided by the Swiss Federal Office for the Environment show that every Swiss person uses 125 kg of plastic each year – which apparently is around the European average. We collected our personal plastic waste over a number of months – the amount that accumulated is impressive. The result of this collection can also be seen in the exhibition. In December 2011 the plastic garbage project acquired a committed project partner in the form of the Drosos Foundation. This foundation promotes skills and creates circumstances that help people to accept responsibility for themselves, for others and for the environment. The planned educational program supports this fundamental idea. In addition the partnership made it possible to expand the Zurich exhibition into an international traveling show. This means that the plastic garbage project can be shown throughout Europe. A major gain for the project – and hopefully also for our seas! An exhibition with a huge installation made up of plastic garbage that is later intended to tour the whole of Europe represents a considerable challenge for the exhibition architecture. And the task becomes even more difficult when, in accordance with the focus of the project, the aim is to make the whole thing as ecological as possible. Zurich scenographer Alain Rappaport designed a modular exhibition architecture that is based on light folding pallet frames. For transport the exhibition objects can be stored in these pallet frames. 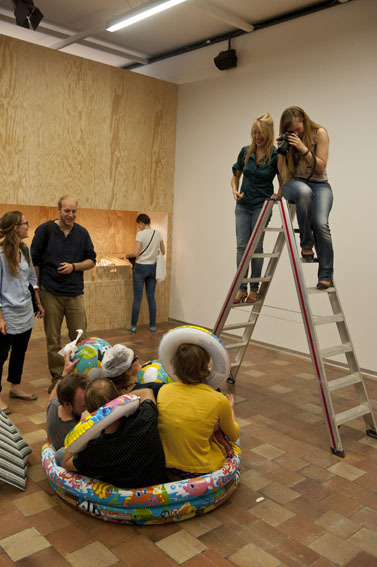 The visual language refers to the field of tension between the raft and the supermarket. From Kahului through the Panama Canal across the Atlantic, up the Rhine and finally to Zurich: in February 2012, following a sea voyage of several months, the precious cargo from Hawaii reached us. After dealing with considerable logistical complexity, predictable import difficulties, and a number of reservations about the condition of the garbage the containers could finally be opened. What the volunteers had been able to collect on the beach of an uninhabited Hawaiian island was truly incredible. In special white bags there were plastic objects that showed the marks of shark attacks. The 4.6 tons of plastic waste were laboriously transferred by hand to the container in which the exhibition will later tour Europe. The exhibition was set up from mid-June onwards. First of all some of the walls were erected, then the plastic garbage was brought into the hall and, once the dust had settled somewhat, the exhibits were put in position. Clearly, the absolute highlight was the unpacking and distribution of the flotsam from Hawaii. People wearing gloves and face masks dumped roughly three metric tons of plastic debris in the central aisle of the exhibition hall. In the course of doing this all kinds of bizarre plastic objects were found, some of which were extracted and specially displayed. 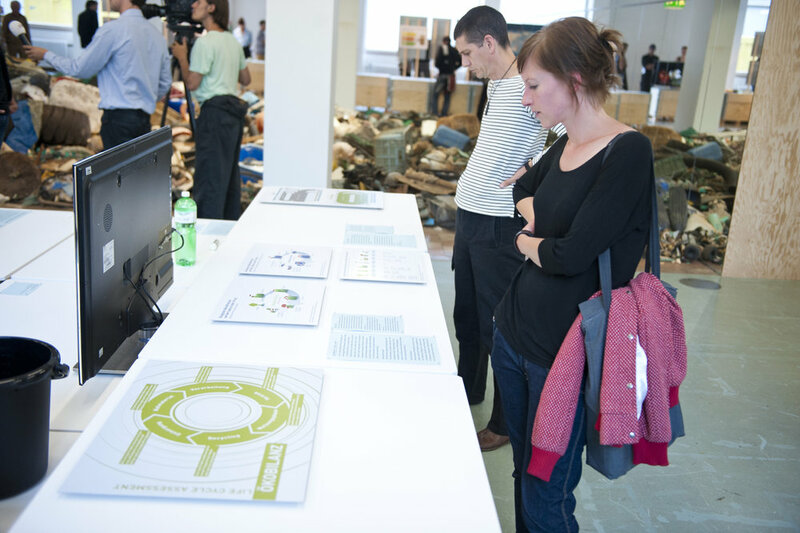 Then, on Tuesday, 3 July 2012 the day had finally arrived: the exhibition was opened. After welcoming addresses by Zurich State Councilor Regine Aepli and Stefan Kraft from the Drosos Stiftung, Christian Brändle, Director and Curator, and Angeli Sachs, Curator Museum für Gestaltung Zürich, led people into the exhibition. The intention to reach people through the impact of the sheer amount of plastic garbage was successful. The message of the central installation is crystal-clear. With the planned international tour in mind the exhibition was designed to be light and modular so that everything could be transported in a single container. 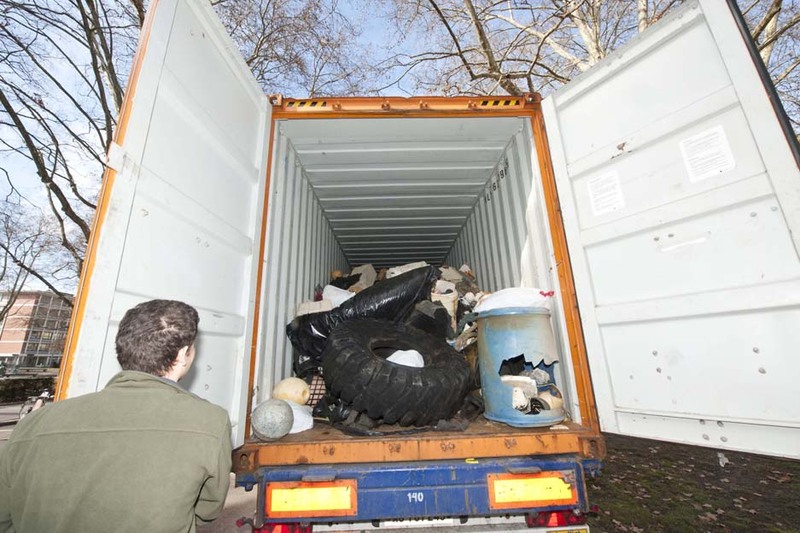 From February 2012 the transport container, which was acquired especially for the exhibition, stood in the park in front of the Museum für Gestaltung Zürich. After the opening of the exhibition the container’s rusty appearance was freshened up somewhat. With the help of a stencil the web address was sprayed on both of the long sides – and so the container was officially labeled. It very soon became clear that the exhibition in Zurich was a big success. On this account the originally planned duration of twelve weeks was extended by a further five weeks. When the show definitively closed on 28 October, a total of 35'779 visits had been recorded. In the following weeks the exhibition was dismantled and preparations were made for the international tour. All the exhibits were packed into crates that had earlier served as the exhibition architecture. Packing the huge installation of plastic garbage presented a special challenge. Only a month and a half later, the exhibition opened at its first international venue, in Hamburg, Germany. The rich educatiolnal program was also carried out in different forms in subsequent international exhibitions as well. After this successful kickoff, the tour continued in 2013 with two exhibition sets traveling on to Finland, Sweden, and Denmark. Until that point, the tour had focused on Northern European countries. In 2014, after another venue in Germany, the exhibition was shown in Belgium and then, in its first Southern European venue, Spain. In 2015, amid a stop in Denmark, the tour went east for the first time, to Graz, Austria. With a show in Marseille in 2016, Out to Sea? headed south again, and after France, the exhibition journeyed on to the Netherlands and Slovenia. In spring 2017, Out to Sea? was once again on display in Sweden. 2015: First Stop in Asia! In November 2015, thanks to the fantastic support provided by the Consulate General of Switzerland in Hong Kong, Out to Sea? opened for the first time in Asia and marked the highlight of that year’s international tour. Due to the encouraging success of the European exhibition, the Drosos Foundation supported staging the exhibition in certain of its other priority countries, including Egypt, Jordan, Lebanon, and Morocco. Most of these countries face serious environmental challenges, some of which could be mitigated with the right measures. 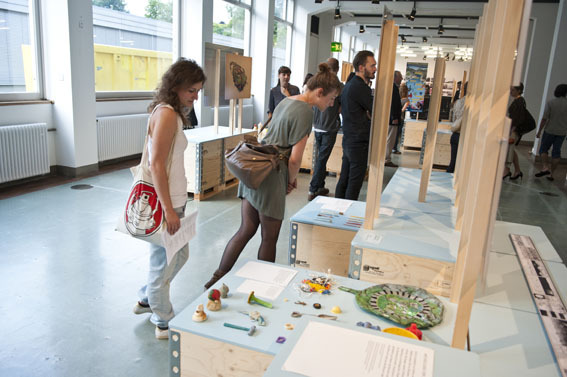 The team was convinced that the original exhibition should not simply be replicated in those countries. So plastic waste was collected locally and partners were supported in the development of an interactive educational program to raise awareness among civil society and decision makers. For this tour, a new, additional website was created and the exhibition content was translated into Arab and French. The tour premiered on October 31, 2014 in Casablanca, Morocco. It subsequently traveled to Lebanon, Jordan, and Egypt, with several venues in each country. The tour ended with its last show in Agadir, Morocco, at the beginning of July 2015. For Out to Sea?, the educational program is of high value. The 2015 international conference “Talking about Plastic Garbage” drew from the wealth of experience gained during the international tour. Based upon the insights into the educational practice gained at the various venues, the conference raised questions about educational strategies and approaches with the ultimate goal of learning from experience. By 2016, more than half a million people visited Out to Sea? Unfortunately, the problem of plastic in our oceans is not even close to being solved. However, while the Plastic Garbage Project made its great tour, numerous organizations and initiatives have arisen and knowledge about the problem has increased. In 2017, the Plastic Garbage Project Team of the Museum für Gestaltung has created an updated version of the exhibition and the website. Drosos Foundation has agreed to support the project until 2020. To continue this successful tour, the team is currently looking for additional venues around the world.